It seems that for the past two years, we’ve had our heads in the stars… studying space. Even our family Netflixing is centered around Star Trek! 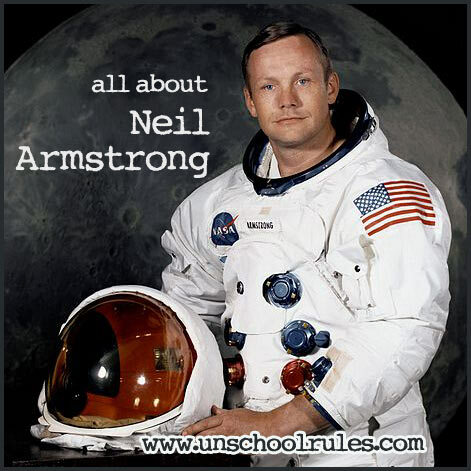 So it’s probably no surprise that as the iHomeschool Network celebrates some noted historical figures born in August, I’d choose to commemorate one of our favorite space personalities – Neil Armstrong! Armstrong is best known for being the first person to walk on the moon (as part of the Apollo 11 mission with Buzz Aldrin and Mike Collins), but his original career choice was not in spaceflight. His goal, actually, had been to be a test pilot, and he was a great one, reaching records in both speed and height for the time and, over the course of his career, flying more than 200 different types of aircraft. He also served as a Navy pilot during the Korean War, flying 78 missions over Korea. In 1962, he was invited by Deke Slayton to join NASA as part of the “New Nine,” or second set of astronauts. While his Apollo 11 moon-landing mission was probably the most commonly remembered, Neil Armstrong went into space earlier as part of the Gemini 8 crew; that mission went up in 1966 and involved docking two spaceships together while in orbit. A critical systems failure required the mission to be aborted after only a few hours, but Neil (and the rest of the crew) thought quickly and all survived. We’ve watched footage of the landing many times, and heard and read many stories that say that Neil Armstrong intended to say “That’s one small step for a man, one giant leap for mankind,” but recordings have always seemed to indicate that he dropped the “a,” which kind of messes with the meaning a little. Just in the past few months, however, research by linguistics experts seems to think it might have been there after all! When Armstrong passed away on Aug. 25, 2012, America lost one of its greatest pioneers. Always a humble and private man (perhaps even MORE so after the famous landing), it was fitting that his burial at sea was relatively private, but the photos I saw from it touched me deeply. Space exploration is a topic that we spent a LOT of time reading, watching and otherwise learning about in recent years. 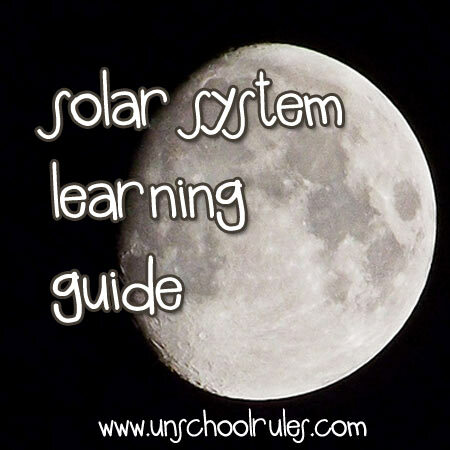 If you’re interested in digging deeper into this topic, please check out To the moon and back: Best resources for solar-system study. That learning guide post that wraps up so many of the great books, movies and trips we found valuable! Find more about Neil Armstrong on Wikipedia. NASA also offers a basic Neil Armstrong biography. Perhaps my favorite set of basic facts (in Q&A format) about Neil Armstrong come from this post on Space.com. The Armstrong Air & Space Museum in Neil’s Ohio hometown is well worth a trip – we’re considering a visit this fall! Last year, Amy at Milk and Cookies celebrated Neil Armstrong’s birthday as part of the August iHomeschool Network celebration. Check out her amazing post, Discovering Neil Armstrong, for moon-related crafts, a printable on how to say “moon” in other languages, coloring pages and more! I admit it – we’ve talked SO MUCH about space that it’s almost hard for me to boil down our questions to a few interesting bullet points you might want to discuss. That said, here are a few of the many! Being first. Was it right that Neil Armstrong, not Buzz Aldrin, walked on the moon first? Was it right that Armstrong got so much more attention for what he did? And what about Mike Collins, who had the unenviable job of staying up in space, circling the moon, while Buzz and Neil were in the LEM (landing module)? The future of our space program. I admit that in our family, we’re not happy with the turn away from space exploration following the Apollo missions. That said, we’re incredibly interested in things like the the recent decision to start working on the Human Spaceflight initiative to promote deeper-space human travel, as well as private space exploration like SpaceX. What are your thoughts on space exploration? What are the benefits vs. the risks? Rights and responsibilities. Who “owns” space? What are our responsibilities when exploring – and, in the future, possibly colonizing – moons and planets? When I took my astrobiology course via Coursera, we talked about these issues in some detail, and surprisingly, they came up again in my recent archaeology course! If you’re interested, there are many more cool “August birthday” lessons from my fellow iHomeschool Network bloggers. Click the image below to check them out! And thanks for stopping by to help me wish Neil Armstrong a happy birthday! This entry is about books, famous birthdays, science, unit study. The previous post was A birthday celebration: Learning about Annie Oakley, a wonderful woman of the Wild West. The next post is The unschooled version of an eighth-grade-ish curriculum plan for 2013-14. We have been learning about Neil Armstrong lately, too. This is a great resource.